A report on Wednesday claims Apple and China Mobile have finally inked a deal to sell the popular iPhone on the world's largest wireless network, with devices supposedly heading out to customers later in December. Citing sources close to the matter, The Wall Street Journal reports that Apple and China Mobile have struck a deal to make the iPhone available to the telecom's 740 million subscribers. The partnership has been a long time coming, with rumors of a possible China Mobile iPhone offering dating back years. 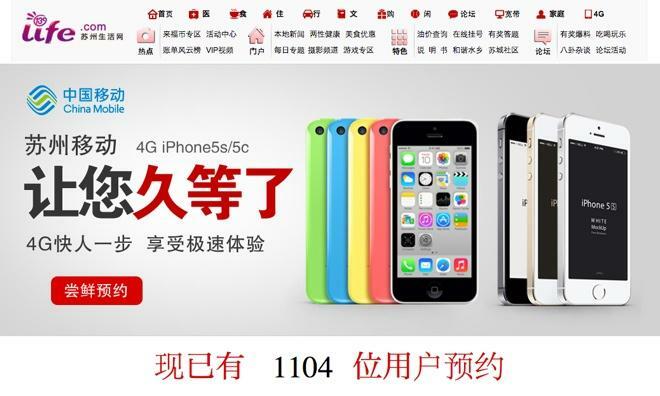 Most recently, a China Mobile subsidiary in Suzhou opened preorder reservations for both the latest iPhone 5s and iPhone 5c through its website, though the page was subsequently replaced by a survey gauging customer demand for 4G devices. With China Mobile's unique TD-LTE network rollout coming in mid-December, many industry watchers expected sales for Apple's smartphone to go live this month. A report from the state-run Xinhua News Agency in November cited insiders as saying both new iPhone models would, in fact, be available on the 4G network's official Dec. 18 launch date. China Mobile is the largest cellular carrier in the world, with some 740 million subscribers spread across the Chinese mainland, Hong Kong and overseas. Of that massive number, only a fraction are 3G subscribers who would likely be the first to adopt faster, more expensive 4G technology. Even so, Apple is looking at well over 100 million potential customers at the outset, with the chance to tap into hundreds of millions more down the road.